Monitored anesthesia care (MAC) is a specific anesthesia service for diagnostic and therapeutic procedures. It includes safe conscious sedation, adequate pain relief, and measures to allay anxiety. Even though it involves minimal anesthetic intervention, it is essential for an anesthetist to know about the patient history. Many ophthalmic drugs have significant anesthetic implications, and many anesthetic drugs cause significant intraocular pressure changes. In this article, we have highlighted the importance of MAC in ophthalmic procedures and implications of various anesthetic agents in eye surgeries. The various ophthalmic blocks and their complications and the toxicity which can occur with the use of local anesthetics have also been touched upon. Monitored anesthesia care (MAC) is a specific anesthesia service for diagnostic and therapeutic procedures which are performed under local anesthesia (LA). It includes sedation and analgesia, titrated to a level that preserves spontaneous breathing and airway reflexes, according to the latest American Society of Anesthesiologists update in 2008. Ideally, it is suited for daycare procedures as it helps in fast tracking of patient. MAC is an anesthesiologist-led service as it is very important for the provider to be qualified and skilled to rescue an airway and/or convert to general anesthesia if the situation demands. It also involves intravenous (IV) administration of drugs alone and/or supplementation to LA/regional anesthesia. The standard of care is similar to that of general or regional anesthesia, which includes a proper preanesthetic examination, standard intraoperative monitoring, and postoperative care. Monitoring comprises continuous communication with a patient, observation of parameters such as oxygenation, ventilation, circulation, temperature, as well as vigilance for LA toxicity. Sedation is a continuum which ranges from minimal (anxiolysis), to moderate (also called conscious sedation, where the patient remain asleep but is easily arousable), to deep sedation (where the patient can be aroused only by painful stimuli) [Table 1]. Assessment of the depth of sedation enables in titrating drug administration to prevent awareness and to avoid excessive anesthetic depth, thereby ensuring patient safety and early recovery. An ideal sedative agent should be consistently effective in having rapid onset, easy titration, high clearance, and minimal side effects, particularly a lack of cardiovascular and respiratory depression. Due to dearth of an ideal agent, sedation techniques for MAC often utilize a combination of agents to provide analgesia, amnesia, and hypnosis with complete and rapid recovery that suits a particular operative procedure with minimum side effects, such as postoperative nausea and vomiting, prolonged sedation, and cardiorespiratory depression. Duration of procedure, clinical condition, age of the patient, and the need to convert to general or regional anesthesia help to guide toward the selection of appropriate sedation technique. Fewer sedative drugs are required in geriatric population as chances of desaturation and cardiovascular instability are more. Apart from distribution and elimination half-life, factors such as context sensitive half-time, effect-site equilibration, and potential of interaction with other drugs need to be taken into account while choosing the drugs. Prevent recall of unpleasant perioperative event. It should be the same as for patients who are undergoing procedures under regional or general anesthesia. There should be no compromise of any sorts just because the patient is to undergo the procedure under MAC. Moreover, it is very important to assess the patient's ability. 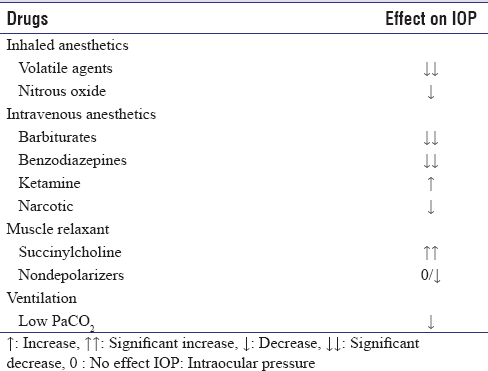 Majority of the anesthetic drugs cause a decrease in intraocular pressure (IOP), except succinylcholine and ketamine  both of which have known to increase the IOP [Table 2]. Ophthalmic drugs have several anesthetic implications. [Table 3]. Routinely used drugs such as phenylephrine and beta-blockers can cause hypertensive crisis and bradycardia and bronchospasm, respectively. Mannitol can increase the circulating blood volume and can precipitate congestive cardiac failure (CCF) in patients with poor ventricular function. Similarly, atropine can cause tachycardia and echothiophate which is an anticholinesterase can cause prolongation of succinylcholine action. In procedures such as retinal detachment, sulfur hexafluoride bubble is used. 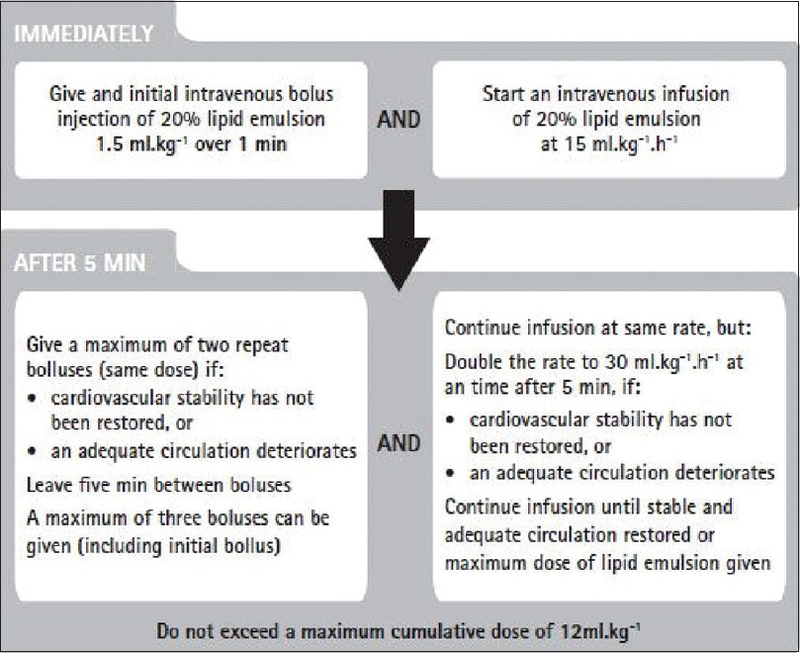 In such procedures, the use of N20 can cause increase in size of bubble and increase IOP [Table 3]. 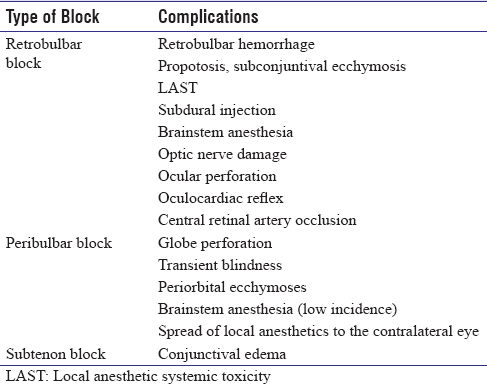 The complications of ophthalmic blocks are summarized in [Table 4]. Oral anticoagulants showed no significant increase in potentially sight-threatening complications with regional anesthesia. IV anticoagulants showed that it is better to avoid regional anesthesia and prefer to administer general anesthesia. It is also known as Aschner phenomenon, Aschner reflex, or Aschner-Dagnini reflex. The incidence of occurrence of about 14%–90% is seen in pediatric patients, especially those undergoing strabismus surgery, although it can be evoked in all age groups and during a variety of other ocular procedures. 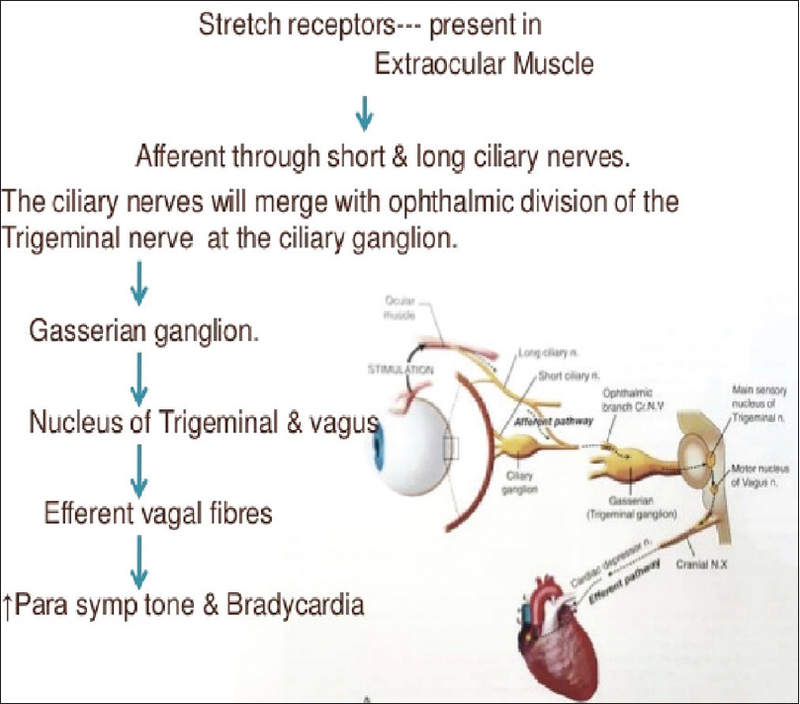 There are various stimulus that can lead to oculocardiac reflex, few most common stimulus are traction of extraoccular muscle (especially medial rectus), conjunctiva, pressure on globe, retrobulbar block, ocular trauma, pressure on tissue remaining after enucleation. Oculocardiac reflex leads to bradycardia, arrythmia including ventricular tachycardia and rarely asystole. In recalcitrant episodes, infiltration of the rectus muscles with LA. The reflex eventually fatigues with repeated traction on the EOMs. Intramuscular atropine is not useful due to delayed onset. In children, injection glycopyrrolate 0.01 mg/kg IV before commencing surgery is indicated. In adults, prophylaxis is not usually indicated. To summarize, the plan for monitored anaesthesia care in opthalmic surgeries is that after the preoperative assessment and consent is obtained, stabilizing of patient comorbidities is done. On the day of surgery, the patient should be accompanied by a responsible attendant. Clear liquids are allowed 2 hours before procedure. Make sure patient voids and then the patient is connected to monitors and intravenous cannula is secured. Local anaesthetic is administered and the patient is intraoperatively monitored with ECG/SPO2/ NIBP/EtCO2. At the end of surgery, the patient is shifted to the recovery ward and later discharged after satisfying the discharge criteria. Local Anesthetics (LA) agents can be divided into two groups based on their structure, esters and amides [Table 5]. These relate to the LA, the block, and the patient. The type and dose of LA injection influence toxicity risk. Bupivacaine > levobupivaciane, ropivacaine > lignocaine. The site is important since some sites have a higher risk of direct intravascular injection (e. g. interscalene or stellate ganglion block) and others carry an increased risk of rapid absorption and toxicity due to the injection being in a highly vascularized area. IV > intercostal > caudal > epidural > brachial plexus > subcutaneous. Avoid excessive sedation to allow early detection of LA systemic toxicity. The evaluation of patients with possible toxicity from a LA should be guided by the clinical presentation. Blood levels of the anesthetic may be measured although blood levels may not correlate with toxicity or may not be obtained at a clinically useful time. Ghisi D, Fanelli A, Tosi M, Nuzzi M, Fanelli G. Monitored anesthesia care. Minerva Anestesiol 2005;71:533-8. Sheahan CG, Mathews DM. Monitoring and delivery of sedation. Br J Anaesth 2014;113 Suppl 2:ii37-47. Das S, Ghosh S. Monitored anesthesia care: An overview. J Anaesthesiol Clin Pharmacol 2015;31:27-9. Barash P, Cullen BF, Stoelting RK, Cahalan M, Stock MC, Ortega R. Clinical Anesthesia. 7th ed. Philadelphia: Wolters Kluwer Health/Lippincott Williams & Wilkins; 2013. p. 824-38. Miller RD. Miller's Anesthesia. 8th ed. Philadelphia, PA: Churchill Livingstone/Elsevier; 2015. Calenda E, Genevois O, Cardon A, Muraine M. Peribulbar anesthesia in 750 patients treated with oral anticoagulants. Int J Ophthalmol 2014;7:110-3. Gilani MT, Sharifi M, Najafi MN, Etemadi Mashhadi MG. Oculocardiac reflex during strabismus surgery. Rev Clin Med 2016;3:4-7. Dewar KM. The oculocardiac reflex. Proc R Soc Med 1976;69:373-4. Neal JM, Mulroy MF, Weinberg GL; American Society of Regional Anesthesia and Pain Medicine. American Society of Regional Anesthesia and Pain Medicine Checklist for managing local anesthetic systemic toxicity: 2012 version. Reg Anesth Pain Med 2012;37:16-8. Christie LE, Picard J, Weinberg GL. 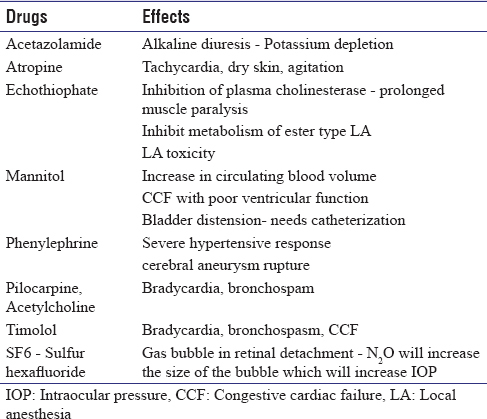 Local anaesthetic systemic toxicity. Contin Educ Anaesth Crit Care Pain 2015;15:136-42. Gómez RE, Araque HF. Rev Colomb Anesthe 2011;39:40-54.